I’ve been in pain for the last month. At first, the pain in my hand would come and go. 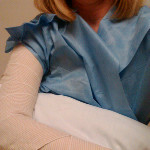 Gradually, the pain moved to my wrist, up my arm and eventually to my shoulder. I spend too much time on the computer, there’s just no way around it. Between email, blogging, Twitter, Facebook and LinkedIn, my fingers are constantly tap-tapping away. I’m typing away at the keyboard for most of the day and when I’m not sitting in front of my laptop, I’m often clicking away at my smart phone, delightfully unaware of the abuse I’m inflicting upon my body. And the truth is, once I began to realize that this was likely the cause of my pain, I should have acted more quickly to change my habits. My hand and my arm, from my knuckles to my shoulder, were in such intense pain, that the doctor was unable to do a thorough assessment lest I break down in tears. For the time being, my arm is completely immobilized with a rigid cast sort of thing that runs from the top of my hand through my shoulder. A few days ago, I suddenly found myself in the search for an alternate way to work on the computer without the need for my fingers to dance upon the keys. My situation is not unique. There are many who, due to injuries, limitation, disability, or occupation, similarly find typing on the computer for extended periods of time a challenge. Surely, I could easily learn a new way to get work done. Many of my friends recommended the same software, something called Dragon Naturally Speaking which works on PCs. I ended up buying the sister product called Dragon Dictate, which is designed to work on a Mac. I would like to say that the software has been simple to use and immediately provided a solution allowing me to keep my hands off the keyboard. I would really like to say that, but it just wouldn’t be true. While its ability to turn my spoken words into text is impressive, I have found the software to be anything but intuitive. In my mind a program like Dragon dictate has three main functions. First and foremost, is the ability to listen to my words and transcribed them into text. Second, are the features which enable me to edit the text I dictated; to go back and make additions or corrections where necessary. Third, Dragon Dictate also includes numerous commands which (theoretically) allow the user to navigate between various windows and programs. Getting started is deceptively easy. The first step involves training the software to understand your voice. All that’s required is to read a couple paragraphs of text aloud. After doing this, the training is done and you’re off and running. Unfortunately, I quickly found myself needing to edit content when the software misunderstood me. The process of learning the edit and navigation commands has been surprisingly difficult. Ordinarily, I’m extremely comfortable learning to use a new piece of software. Most software today is designed to be user-friendly and intuitive; it is rarely necessary to read instructions or search the help documents which are provided with any new program. I’ve found Dragon Dictate to be neither user-friendly, not intuitive. Not only are there no video tutorials with Dragon Dictate, searching the help documents is an extremely frustrating experience. Still, despite the temptation to give up, it is still enormously better than the alternative. Please see the video below for a real-time example of the program as I use it. Be sure to watch it in full-screen mode. Most of this post was originally written by speaking into Dragon Dictate, though many manual edits and corrections were necessary. Though exasperating, I will keep at it and am certain that my mastery will improve. What has been your experience? Have you used voice recognition software before? Do you have any tips to share with those of us who spend too much time at the keyboard? I’m sorry to hear about your RSI injuries. I hope that you can recover well enough to be able to type again soon. I’ve never used Dragon products, but I have a friend who is a programmer, who wound up in the same situation (RSI prevented him from typing). He eventually found himself Dragon Dictate, and was able to get his work done – perhaps not as fast as before, but still, he was able to work. So hang in there – you’ll get the hang of it, or at least become used to the way it works with you. Anca, thanks so much for your support. I’m sure it’ll get better. Of course typing isn’t the only problem. Driving, eating, cooking, sleeping, brushing my teeth–it’s all difficult right now. I’ve only used Dragon dictation on my iphone – and it works a treat for SMS, email, Twitter etc. Far easier at times than typing on a screen, but still needs manual edits. Hope that your RSI improves with rest. Good to know, Amanda. I haven’t started using it on my phone yet, but that makes great sense as I’m sure part of my problem stems from typing on the phone. Hugs and good well wishes to you! Hi Hayzell. Thanks for your comment and thanks for the link to your post. It’s very interesting and as I spend more and more time using the speech recognition software, taking care of my voice is something I will have to keep in mind. Sorry to hear about your arm pain. Definitely important to take care of these things as early as you can. You won’t go wrong spending a bit more time training the Dragon. The one thing that most folks don’t realize is that dictating ones thoughts is quite a bit different than writing them out…Seems to use a very different part of the brain. Once you get used to it though, dictating becomes quite effortless. Good luck and stick with it, it definitely gets a lot easier. Thanks for your encouragement and suggestions, Michael. I also find odd capitalization issues along with every sentence ending with a single random letter for some unknown reason. I’ve yet to figure out what’s causing these things to happen. I don’t know enough about how the brain processes thought, but I think you’re onto something. It does feel entirely differently to write out my thoughts as opposed to speaking them. Hopefully this will get easier.